Save your video as an mp4. Upload it to your Drive. Make it public. Go to Pop-out and copy embed code. Paste in a Discussion. Home Save your video as an mp4. Upload it to your Drive. Make it public. Go to Pop-out and copy embed code. Paste in a Discussion. Save your video as an mpeg4 (.mp4). Be sure to make note of the title of your file and where it is saving to. Open your video in your Drive, and click the More actions button in the top right corner of the screen. It has three vertical dots. 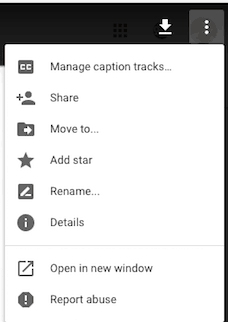 Click the Sharing button that looks like a person with a plus sign, then click tiny word Advanced in the lower right corner on the Share with others box. 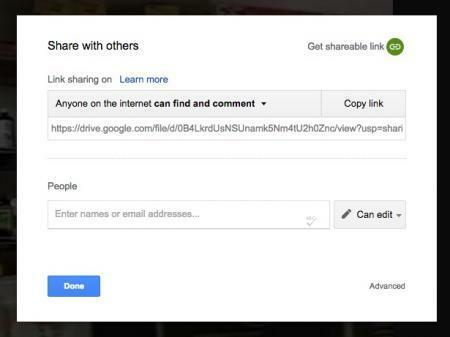 In the Sharing settings box, change Who has access to Public on the web. Also, change Access to Anyone on the Internet can find and comment. Be sure to Save, then hit Done. Open your video in Open in new window, the box with an arrow pointing to the upper-right corner. Under More actions, which is a button in top-right of the Pop-out screen w ith three vertical dots, click on Embed item…, and highlight, then copy (CTRL-C or Command-C) the code that appears in the blue box. Note: This code may not appear at first. It only appears after your video has been processed. Create a new Discussion on Youth Voices, and paste this code in Visual Mode. When you publish, your code will be changed. Your angle brackets < > will be replaced with flat parentheses [ ] and the final closing code will be deleted. Save your video as an mp4. Upload it to your Drive. Make it public. Go to Pop-out and copy embed code. Paste in a Discussion. by Paul is licensed under a Creative Commons Attribution-ShareAlike 4.0 International License.